In some neighbourhoods a lush green lawn is as much a status symbol the house it's in front of. It demonstrates the homeowner's hard work and dedication to maintaining every last blade of grass. And that's what makes the Seedbot even more awesome: it's a simpler shortcut to all that praise and adoration from the neighbourhood association. What's even better is that you can build one of these grass-seed-flingin' bots for yourself on the (relative) cheap because its creator, Instructables' Technology Editor Randy Sarafan, has posted an incredibly detailed step-by-step tutorial on how to bring one to life. 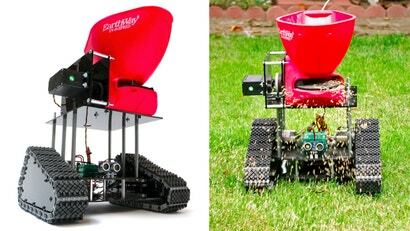 In the end you'll probably end up spending as much time building this bot as you would caring for the average-sized lawn, but this is a far more enjoyable way to spend your time. And if you really want a maintenance-free lawn, you'll have to pair the Seedbot with an autonomous mower and a sprinkler system. But you have until spring to build those too.